If you're looking for information about our location and how to get here, see the Your Visit page. Send us a postcard! 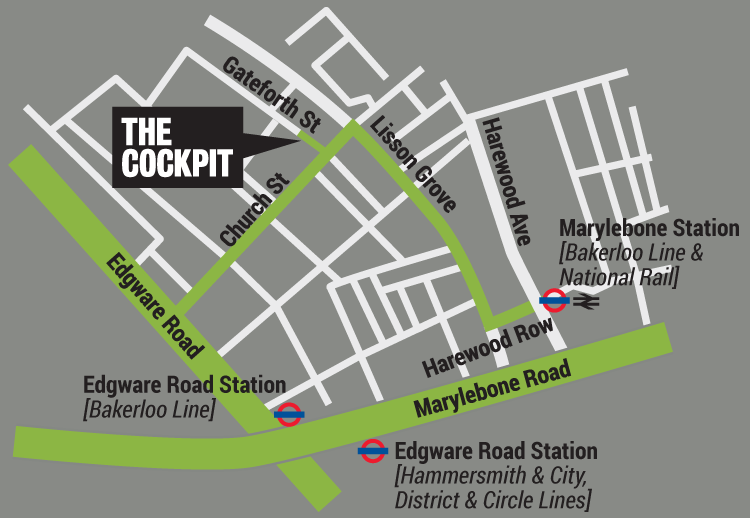 : The Cockpit, Gateforth Street, London NW8 8EH. You can also contact us and keep in touch on Facebook and Twitter. For more specific enquiries, you can contact the person directly. Initial show hire enquiries and negotiations, using the auditorium, brilliant ideas, complaints and plaudits. Contracting and sending out your show info to listings sites. Tom Lee and the management team - building and facilities management, water leaks, noise, vandalism, out of hours email contact. Note about auditions and casting: Every so often we get a flurry of enquiries about castings. If you have seen a casting call and it mentions The Cockpit then it is more than likely that we are merely the receiving venue, and not the producers. If we are involved in castings, we will post details on this site and on our Facebook page. If a company has chosen to advertise on a website that requires you to sign up to see full details, then we ask you not to email us directly to circumvent that process.